Not many people know about shellfish company pesticide use in Washington State marine waters, now in its 55th year. Toxic Pearl tells this story. Widespread pesticide use began in 1963, and has been in continuous use ever since - except one year. Starting in 1962, carbaryl ... toxic to anything with a nervous system ... was sprayed by helicopter to kill two species of native shrimp to make way for non-native and invasive Pacific oysters. They sprayed annually, even though the state estimated that the permitted spraying killed over 10 million animals. Toxic Pearl shares the stories of 3 men sprayed with carbaryl on the tideflats, and the stories of 6 citizen activists who tried to stop shellfish company pesticide use, two of which were shellfish farmers. 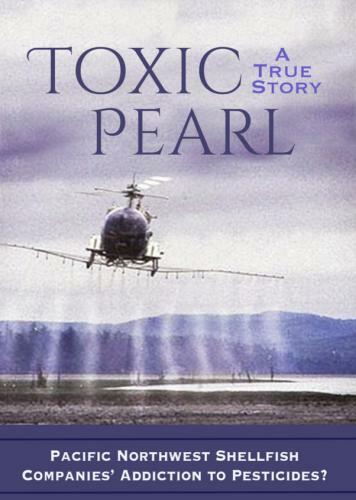 Toxic Pearl recounts the Shoalwater Bay Tribe's abnormally high infant mortality rate of the 1990s, and their protest against the annual spraying of Willapa Bay, which continued unabated ... even augmented ... with new pesticides to kill non-native grass introduced by shellfish companies. Toxic Pearl calls attention to shellfish company annual poisoning of Willapa Bay eelgrasses - critical habitat for 55 species, including food for ducks and geese on the Pacific Flyway where every calorie is critical on these epic migrations. The reason? To enhance in-water farms for the lucrative, non-native and invasive manila clam. In the meantime, these same companies market their shellfish as grown in "pristine" waters, using "sustainable" practices, and claim that they are model environmental stewards. In Toxic Pearl, the author reveals the secrets and politics that enabled the destruction of our Washington State native aquatic life, and inspires others to stand up and speak out against this continuing industrial conversion of our marine ecosystem.